The Groom Lake Base is this top-secret military base located 90 miles north of Las Vegas (which is in Nevada). It's in grid number 51 of the Nevada Test Site, so it's called Area 51. The United States Air Force Flight Test Center controls the base. It's best known for testing exotic aircraft and weapons. The base was created in 1954 as a place to test the secret U-2 spyplane that was used to fly missions over the Soviet Union. Then it started to house the SR-71, A-12 and D-21 drone. The F-117A was tested there, also. In the 1980's the base increased in size, along with the runway (which increased to the present 6 miles). Then, mysterious lights began to appear, and armed guards known as the cammo dudes started patrolling the border. 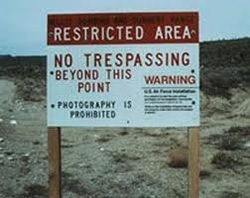 The government closed many viewpoints from which the Area 51 base could be seen. In 1989, a "physicist" named Bob Lazar claimed that he worked at a base south of Area 51 and also claimed that Area 51 was testing extremely advanced aircraft and UFO's they got by trading with the aliens. Since then, Area 51 has been thought to be the test center of captured UFOs because of the lights in the night sky.